The thing I notice most about novelist Haruki Murakami’s style is this: a sense that when I pick up his work, the story has already been happening without me, and when I finish it and put it down, life inside is carrying on somewhere without me too. The fact there is a page 1 and an end page is almost accidental to the story. His first book that I read, Dance Dance Dance, is about an unnamed protagonist who makes a living as a commercial writer and, for me, typifies this style. There is no real explanation for much of what happens and the motivation for the action comes from what has already gone before, before we meet the characters. This is not about a novelist dropping us into a plot in medea res, however. It is about creating a sense of open-endedness in character, perception and affect, as well as storyline. Perhaps this open-endedness is something to do with Murakami’s life as a ‘running novelist’ that he captures in his travelogue/memoir, What I Talk About When I Talk About Running. I read this over the summer, often sitting on a beach, or during a long walk, often alone. For a running would-be novelist, the book captures a sense of discipline and learning that is gently acerbic in its understanding of doing things of value (writing, running). The value of running is always open-ended. Murakami experiences this when running a 62-mile ultra-marathon (well—wow). Beyond a certain point, he explains, “the end of the race is just a temporary marker without much significance. It’s the same with our lives. Just because there’s an end doesn’t mean existence has meaning. An end point is simply set up as a temporary marker, or perhaps as an indirect metaphor for the fleeting nature of existence.” As for running, as for the metaphors of writing. There are two key essences in the book that make it worth reading, beyond an appreciation of Murakami’s own style, his almost poker-faced honesty (perhaps to do with the translation between cultures). If I’m asked what the next most important quality is for a novelist, that’s easy too: focus—the ability to concentrate all your limited talents on whatever’s critical at the moment. Without that you can’t accomplish anything of value… I generally concentrate on work for three or four hours every morning. I sit at my desk and focus totally on what I’m writing. If you concentrate on writing three or four hours a day and feel tired after a week of this, you’re not going to be able to write a long work. What’s needed for a writer of fiction… is the energy to focus every day for half a year, or a year, or two years. You can compare it to breathing. If concentration is the process of holding your breath, endurance is the art of slowly, quietly breathing at the same time you’re storing air in your lungs. Unless you can find a balance between both, it’ll be difficult to write novels professionally over a long time. Continuing to breathe while you hold your breath. 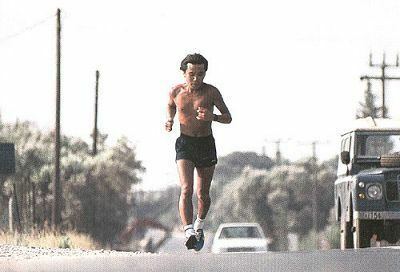 The second essence, that is not written out so directly, is what brought Murakami, at the age of 33 (just a year younger than I am now) to begin his career as both a long-distance runner and a long-form writer of fiction. It was, in no small part, curiosity, and a curiosity about acquiring an openness to life, or even, I’d argue, an open-endedness to life. Curiosity then, “sticking my nose” into all sorts of things, to acquire practical skills to live. What are those skills? Murakami talks first and foremost about acceptance without judgement—one of the assets that Todd Kashdan describes of belonging to those ‘curious explorers’ who live fulfilled and happy lives. If we are open and do not close off judgement too soon – in Murakami’s words, “for now all I can do is put off making any judgements and accept things as they are” – then we are more able to see the potential novelty and meaning in any activity or moment, rather than searching for certainty. The suggestion is, to me at least, that it is this void, this ability to accept all ideas, thoughts and substance, that both is a practice of concentration and the thing within us that makes writing possible. Without that void, created by curiosity and what sounds a lot like mindfulness (“continuing to breathe while holding your breath”), writing long fiction is impossible. At least for Murakami. The methods and directions a writer takes in order to supplement himself becomes a part of that writer’s individuality, what makes him special.